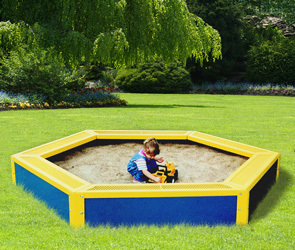 Designed for safety and convenience, this high-quality commercial grade sandbox features six built in bench seats which provide all-around child seating on the inside and adult seating on the outside. Gives your children a fun, safe place with plenty of room to play. Thermoplastic coated for extremely durable, long-lasting weather resistant properties. Finished in slightly textured polyethylene coating available in the color choices below. 3/4 # 9 Gauge Expanded Steel Seats. 11" x 60" Seat Dimensions. 120"L x 102"W x 18"H.